Biotinylated Human CD27, Fc Tag (TN7-H82F6) is expressed from human 293 cells (HEK293). It contains AA Thr 21 - Ile 192 (Accession # NP_001233). The protein has a calculated MW of 47.7 kDa. The protein migrates as 55-70 kDa under reducing (R) condition (SDS-PAGE) due to glycosylation. 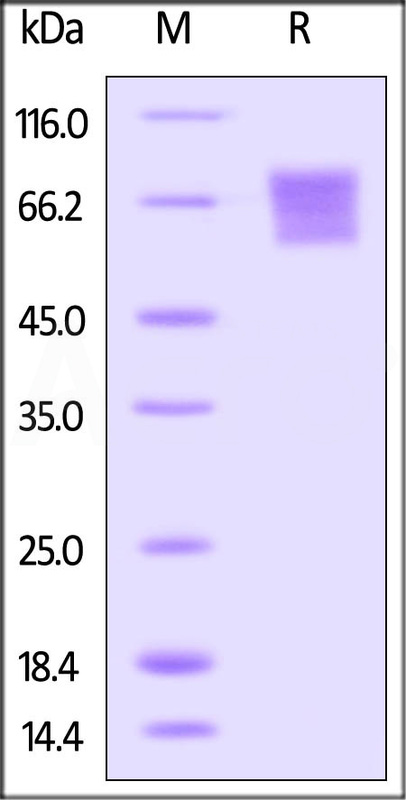 Biotinylated Human CD27, Fc Tag on SDS-PAGE under reducing (R) condition. The gel was stained overnight with Coomassie Blue. The purity of the protein is greater than 95%. Immobilized Human CD27 Ligand, Fc Tag (Cat. No. 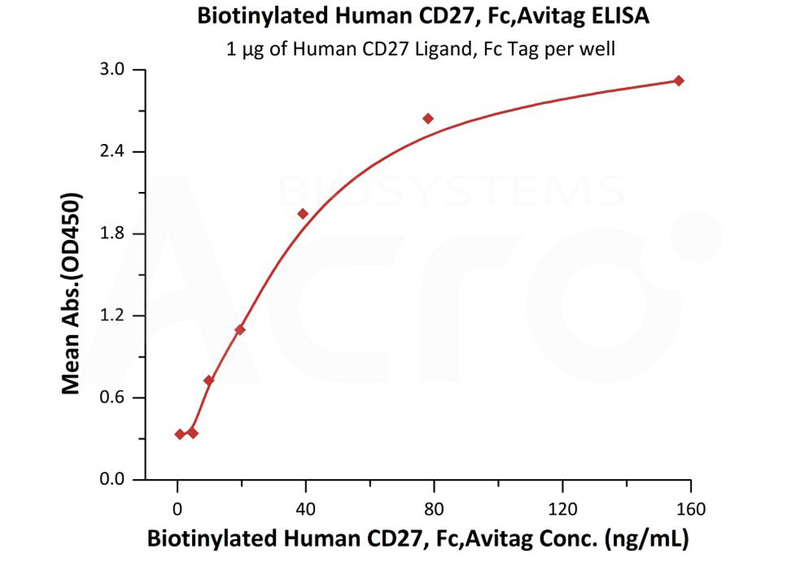 TN7-H526x) at 10 μg/mL (100 μL/well) can bind Biotinylated Human CD27, Fc Tag (Cat. No. TN7-H82F6) with a linear range of 4.9-156 ng/mL (QC tested). CD Antigen CD27 is also known as Tumor necrosis factor receptor superfamily member 7 (TNFRSF7), which belongs to TNF-receptor superfamily. CD27 / TNFRSF7 is found in most T-lymphocytes. CD27 / TNFRSF7 is required for generation and long-term maintenance of T cell immunity. It binds to ligand CD70, and plays a key role in regulating B-cell activation and immunoglobulin synthesis. This receptor transduces signals that lead to the activation of NF-κB and MAPK8/JNK. CD27 has been shown to interact with SIVA1, TRAF2 and TRAF3. (1) Zhang Z., et al., 2004, Protein Sci. 13:2819-2824. (2) Gravestein L.A., et al., 1998, Eur. J. Immunol. 28:2208-2216. (3) Prasad K.V.S., et al., 1997, Proc. Natl. Acad. Sci. U.S.A. 94:6346-6351.